Love That Max : Special Needs Blogger Weekend Link-Up: Good stuff! 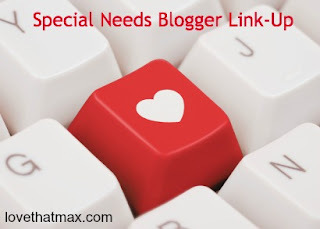 Special Needs Blogger Weekend Link-Up: Good stuff! It's another Special Needs Blogger Weekend Link-Up, your home away from home. Or something like that. Thanks for the LinkUp opportunity! I always find great blogs to follow! Thanks once again. :) I have several posts I wanted to share, but stuck with the one about day two of our vacation [link 18 above] this year, as it gives a comical (in a way) glimpse into our son's fears. All three days are blogged about in their own posts, but I wanted to share day two the most. Thanks for hosting this link-up. I linked to Day 1095:God only gives special children to special people? it's about how I feel when people say "God only gives special children to special people". Thanks for the link,...being part of a community,...helps soooo much!!! Thanks for hosting this wonderful linky again! I posted a rather older post this week, I know the rules say from the last week, but I thought a lot about it this past week and hoped it will be ok. Thank you once again! This week I wrote about what my 3 year old (with Apraxia) taught me about serving others. I love it when kids teach me things! Thanks for hosting. I look forward to this link-up each week. Thank you! I posted about our latest check up and encounter with Dr.Ego. I'm discovering so many new blogs too, thanks! Thank you, Ellen. I hope you have a wonderful weekend. Thanks again, Ellen. I've linked to Dexter's Mum's blog. She's not posted for a while, but last night she did... and it's beautiful. It's about the day a 6yr old 'broke her'... temporarily. This is definitely more about me and how I feel with people telling me that I don't SEEM disabled - like it's a compliment or something. I haven't been blogging much latetly, but this week I wrote about how in the last couple years we have begun to see more celebration of individuals with disabilities and differences in the media. I wrote about a Miss America contestant who has a visual disability. I found the fact that she has a visual disability and is in a pageant where one is judged on perfection and beauty to be very remarkable. Thanks! Love this post. It is exactly how I felt when we went to a wedding as a family recently. Didn't see my husband all night. I posted my favorite and most recent blog post from everybody stims. Thanks for the link up. Gotta get reading these!